Most people know Uwe Köhler as the longtime bass player UK Heaven of Bonfire. With the album "UK's Homage" he likes to introduce himself as a singer/songwriter: it's an homage to all his idols of the past and present. Similarities are intentional ! Most people know Uwe Köhler as the longtime bass player UK Heaven of Bonfire. 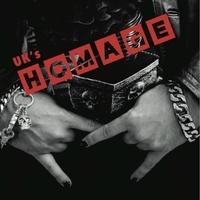 With the album "UK's Homage" he likes to introduce himself as a singer/songwriter: as a long-cherished dream UK made an homage to all his idols of the past and present. Any similarities are entirely intentional and not accidental !